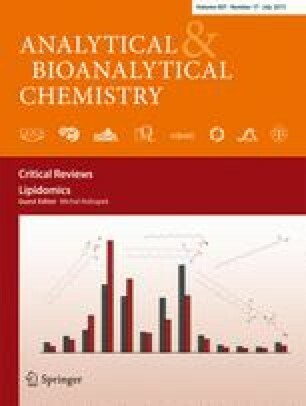 The high chemical complexity of the lipidome is one of the major challenges in lipidomics research. Ion-mobility spectrometry (IMS), a gas-phase electrophoretic technique, makes possible the separation of ions in the gas phase according to their charge, shape, and size. IMS can be combined with mass spectrometry (MS), adding three major benefits to traditional lipidomic approaches. First, IMS–MS allows the determination of the collision cross section (CCS), a physicochemical measure related to the conformational structure of lipid ions. The CCS is used to improve the confidence of lipid identification. Second, IMS–MS provides a new set of hybrid fragmentation experiments. These experiments, which combine collision-induced dissociation with ion-mobility separation, improve the specificity of MS/MS-based approaches. Third, IMS–MS improves the peak capacity and signal-to-noise ratio of traditional analytical approaches. In doing so, it allows the separation of complex lipid extracts from interfering isobaric species. Developing in parallel with advances in instrumentation, informatics solutions enable analysts to process and exploit IMS–MS data for qualitative and quantitative applications. Here we review the current approaches for lipidomics research based on IMS–MS, including liquid chromatography–MS and direct-MS analyses of “shotgun” lipidomics and MS imaging.